Rhone River is a historic river in Switzerland and France and one of the most important inland waterways of Europe. It is the only major river that flows directly into the Mediterranean Sea and its entirely alpine character distinguishes it radically. It is situated southeast of the Rhine, which forgets its alpine features as soon as it leaves Switzerland. Hallmarks of the Rhone often include vigorous and picturesque streams with many tributaries, from start to end. 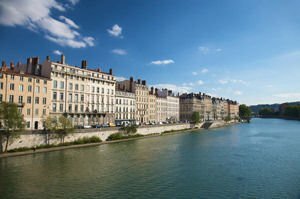 Historically, the river Rhone is defined as the "south gate". Rhone river is one of the largest rivers on the continent. It comes from the eponymous glacier located in the canton of Valais in the Swiss Alps at an altitude of about 2150 meters. Initially the river flows towards the southwest and flows into Lake Geneva. After the lake, it continues to flow towards the southwest until it reaches Lyon. There it turns sharply south and passing the Rhone lowlands, it reaches the Mediterranean Gulf of Lyon. Its mouth forms a delta with two branches whose area exceeds 12 000 square miles. In the beautiful and historic French city of Arles, near the mouth of the Mediterranean Sea, the river is divided into two parts, known as the great Rhone (French: Grand Rhône) and Little Rhone (Rhône Petit). The delta region is known as the Camargue region. The main right tributaries of the Rhone River are Sona and Ardèche, but to the left are Isère, Durance and others. More than three quarters of the area of the river basin consist of mountainous areas. Alpine Heights are situated at the heart of the Rhone river flow. The total length of the river is estimated at 812 km and its catchment area is 95, 500 square km. Prior to the development of highways and railways Rhone River was a major waterway that connects the cities of Arles, Avignon, Valencia, Vienna and Lyon and the Mediterranean ports of Fos, Marseille and Sète. Even at the time of the Greeks and Romans, Rhone was a vital artery. It provided a trade route from the Mediterranean to eastern and central Gaul. Almost all of the Rhone runs with great speed. The water in some sections is moving at 10 km / h.
The word "Rhône" comes from the Latin Rhodanus, which in turn comes from the Greek Ῥοδανός Rhodanos. From Celtic, Rodonosili Rotonos means "Great River". Particular attention should be paid to the Rhone Valley in France. This is a world famous wine growing region, which it produces some of the best wines in the world. Located in Burgundy, in southeastern France, the Rhone Valley mainly produces top-quality red wines and excellent white wines in very limited quantities. You can not pass through there without trying the rosé. The area is the second largest after Bordeaux, with nearly 798 000 acres of vineyards and annual production about 430 million bottles a year. 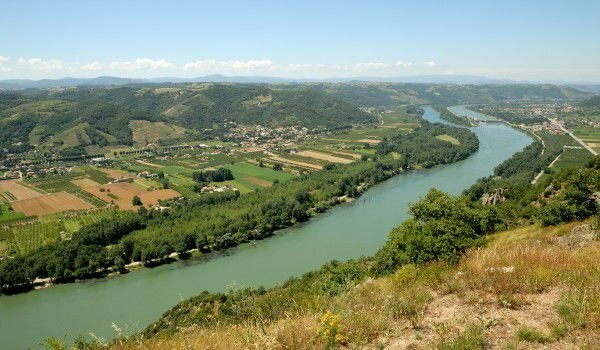 The vineyards stretch from both sides along the length of the Rhone River, almost 125 kilometers out, fertile land is naturally divided into two parts, namely Northern and Southern Rhone.